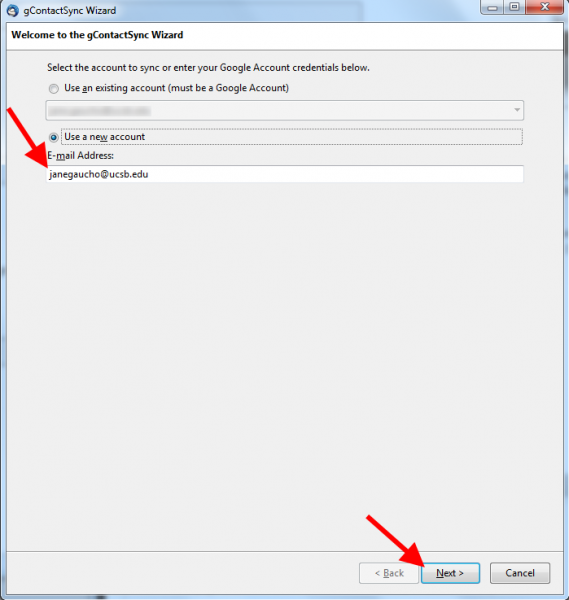 You can access your Connect/Google Apps account with Thunderbird by following the steps in this configuration guide. These screenshots were created largely using version 24 - other versions may look a bit different. On your computer, log into the Google Web App. In the top right, click the gear icon ("Settings") and click Settings. Click Forwarding and POP/IMAP tab. Before configuring Thunderbird, you're going to need to consider how you expect to use Connect/Google Apps. If you expect you'll frequently switch clients, we recommend the Standard Configuration. Alternatively, if you will primarily use Thunderbird and only rarely use the Google Web or Mobile applications, we recommend our Alternate Configuration. Our Standard Configuration is best for accounts that will be used with multiple clients. This configuration will result in slightly poorer performance and will increase the time it takes for Thunderbird to synchronize itself with your Google Apps account, because it will need to synchronize the "All Mail" special folder within your Google Apps account. This special folder includes any message you've already filed into Thunderbird folders as well as any messages you've archived using the Google web or mobile apps. Launch Thunderbird. 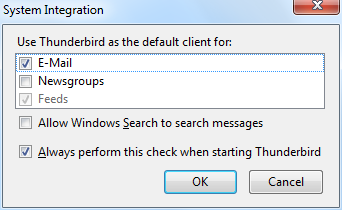 If this is your first time using Thunderbird you may see the following prompt. 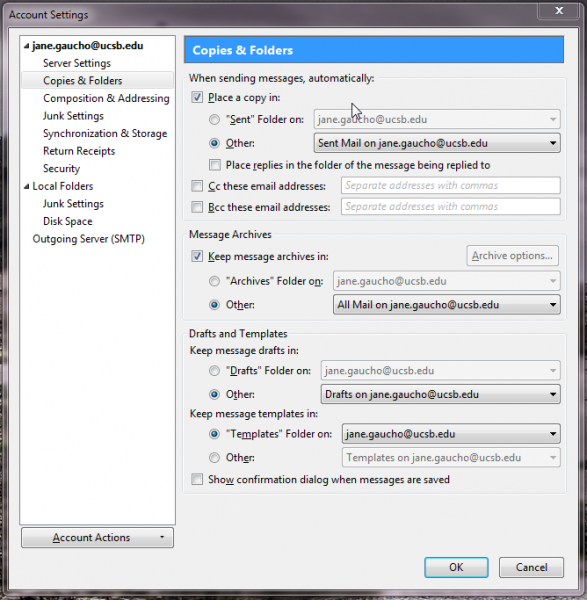 You can elect to make Thunderbird your default email client. 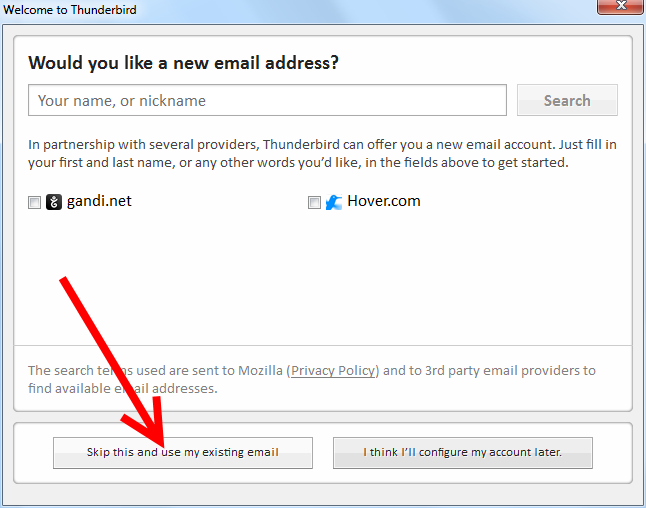 If you have already created another email account in Thunderbird, skip to step 3. 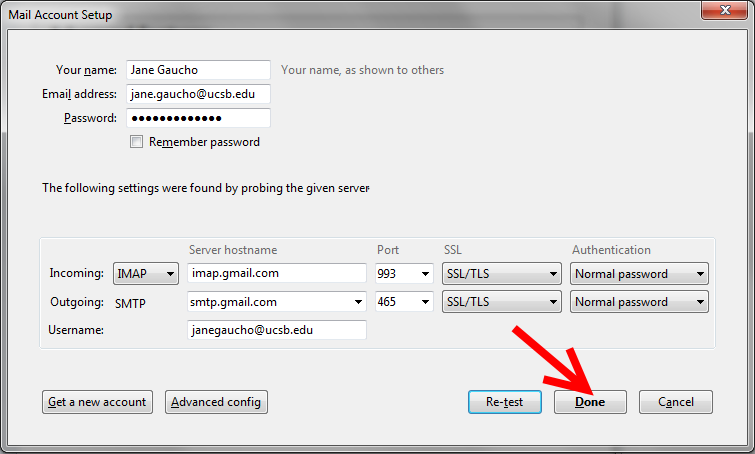 If you have configured an email account in Thunderbird before, select Account Settings from the Tools menu. 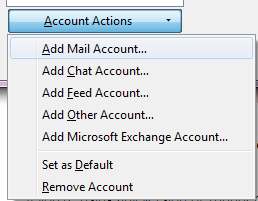 Select Add Mail Account... under the Account Actions menu in the lower left hand corner. Type in your Full name, your Email address (typically firstname.lastname@ucsb.edu) and your UCSBnetID Password. 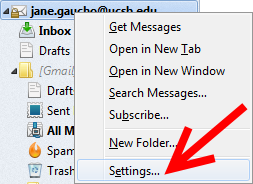 In departments that have chosen to use the department address (<something>@dept.ucsb.edu), you may type that in the Email Address field. NOTE: If you have activated 2-factor authentication ("2FA") for your Connect account, you must use the "app password" you created for Thunderbird. For more information on 2FA and app passwords, go here. 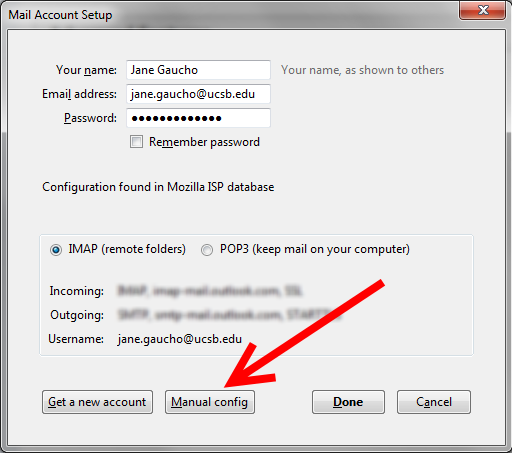 Click Manual config, since Thunderbird will fail to automatically determine the correct account setttings. Type imap.gmail.com for the Incoming and smtp.gmail.com for the Outgoing server hostnames. Select port 993 and SSL/TLS for Incoming. Select port 465 and SSL/TLS for Outgoing. Select Normal password for both Incoming and Outgoing. NOTE: For the Username field enter your Connect Address, which is UCSBnetID@ucsb.edu. Click Re-test. You are successful when you see the message "The following settings were found by probing the given server". Click Done. Click OK to close the Account settings window and click on your Inbox to download your messages and folders- this can take hours, depending on the amount of email you have. Once your folders appear you can continue with this configuration guide by right-clicking on your email address at the top of the left column and selecting Settings. Click on your email address in the left column. In the Signature text box, type the text you would like at the bottom of each outgoing message. 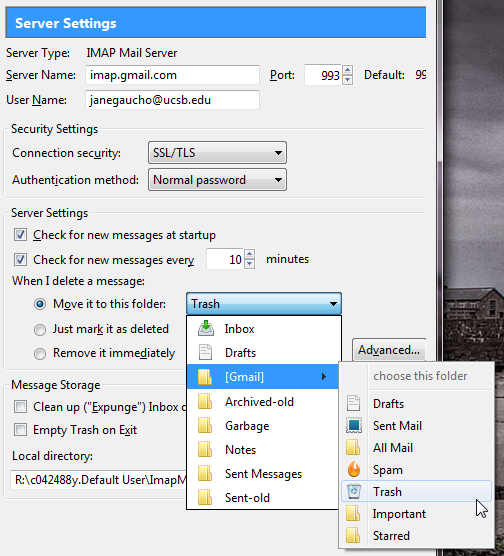 Under Server Settings, confirm that Trash is selected for the Move it to this folder setting. 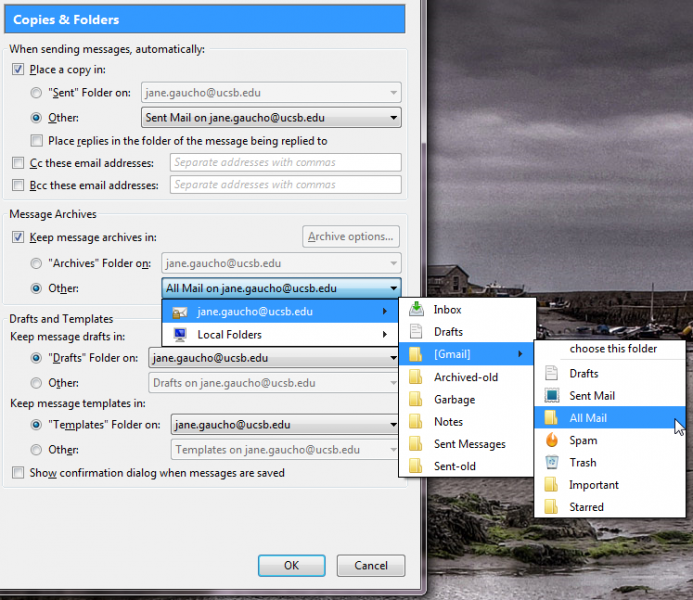 Under Copies & Folders you need to set where Sent, Archived and Draft messages are stored. Under When sending messages, click on Other, and from the drop-down menus, click your address, and select the Sent Mail folder underneath the [Gmail] parent folder. Under Message Archives, check Keep message archives in, click Other, and from the drop-down menus, click your address, [GMail] and All Mail. Under Drafts and Templates in the Keep message drafts in section, click Other, and from the drop-down menus, click your address, [GMail] and select the Drafts folder underneath the [Gmail] parent folder. You can leave the Keep message templates in at the default setting. 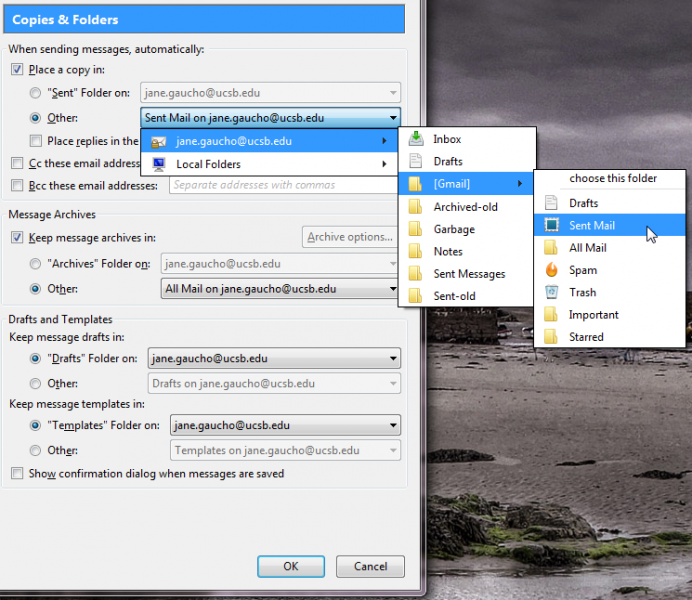 Click on Composition & Addressing, select your defaults for composing messages and optionally configure Thunderbird to use The UCSB Directory (for instructions, go to http://www.identity.ucsb.edu/customers/email_clients/thunderbird/). Note that this applies only to those on the UCSB campus network. The UCSB Directory is not availble to Thunderbird from off-campus locations. Under Junk Settings, un-check Enable adaptive junk mail controls for this account. 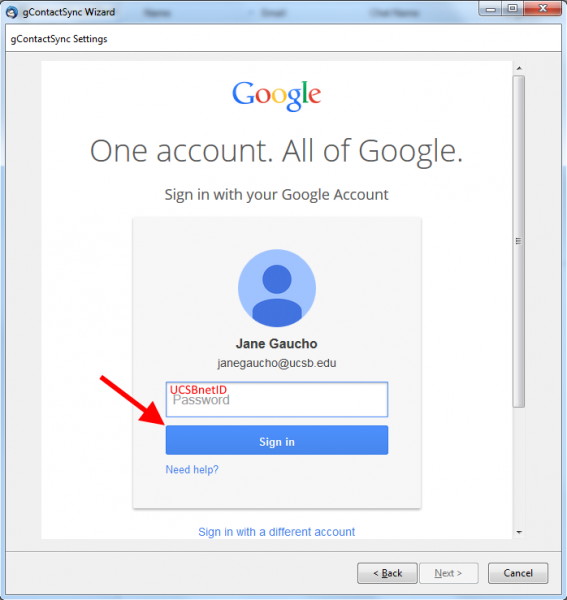 Click OK. You may now begin using Thunderbird with your Connect/Google Apps account. Our Alternate Configuration is best for accounts that will be used only with Thunderbird and not with other clients. This configuration will result in slightly better performance and will not result in duplicate messages showing up in a search. However, any messages that are "archived" using the Google Web or Mobile apps will NOT BE VISIBLE within Thunderbird. 1. Log into the Google Web App to disable the All Mail special folder (which holds Archived messages) from being seen in IMAP clients. In the "gear" icon drop-down, click Settings. 2. Click on the Labels tab and uncheck Show in IMAP for All Mail. After you have unchecked the box you may close the GWA window. 3. 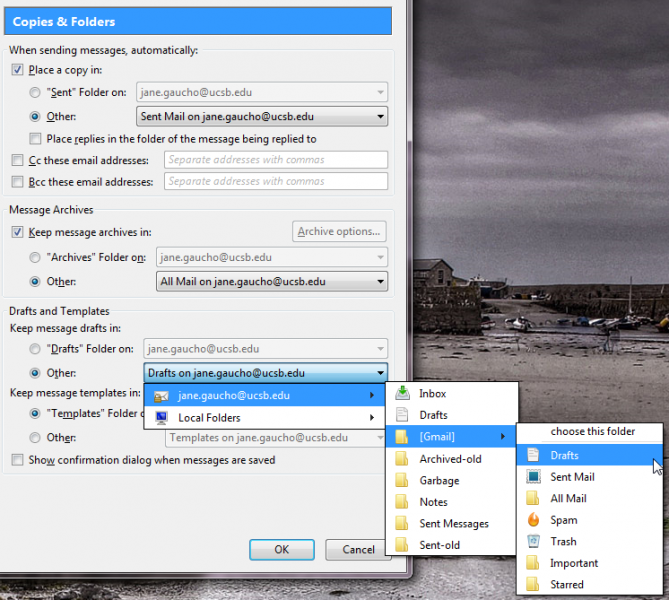 In Thunderbird right-click your email address and select Settings. 4. 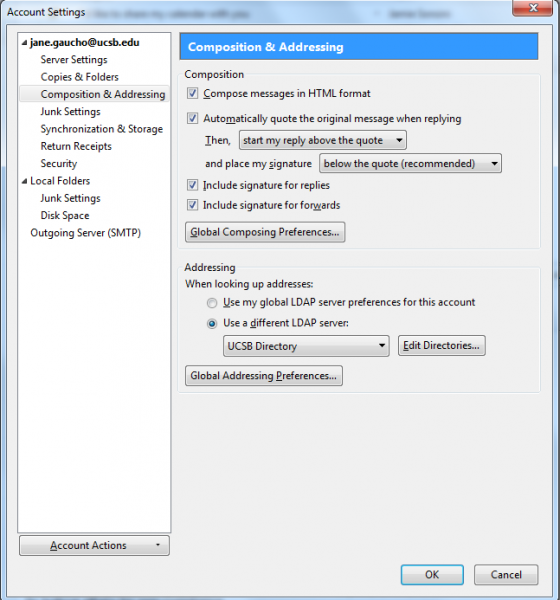 Under Copies & Folders in the Message Archives section, uncheck Keep message archives in. 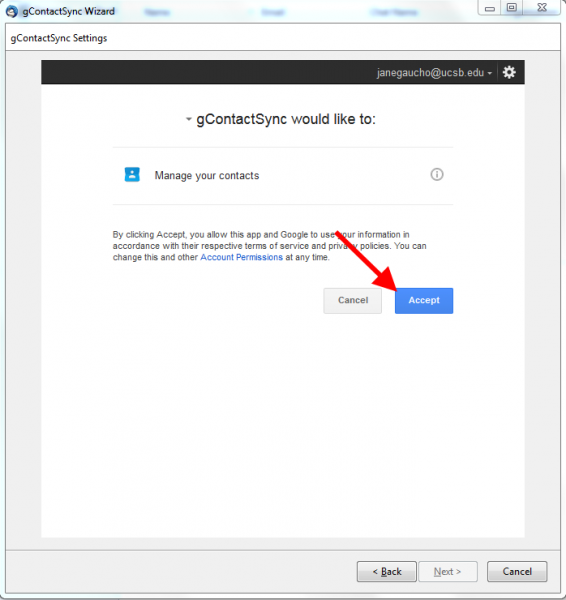 You can access your Google Apps Contacts using Thunderbird by installing and configuring the gContactSync Add-on. In Thunderbird, click the menu button at top right and select Add-ons. At top right, search for "gContactSync". 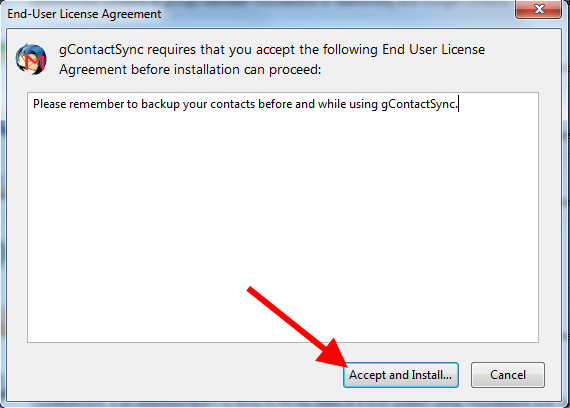 Click the Install button to the right of gContactSync. You can confirm that it has been installed by checking the Extensions tab. Open the Address Book and select gContactSync and New Account. 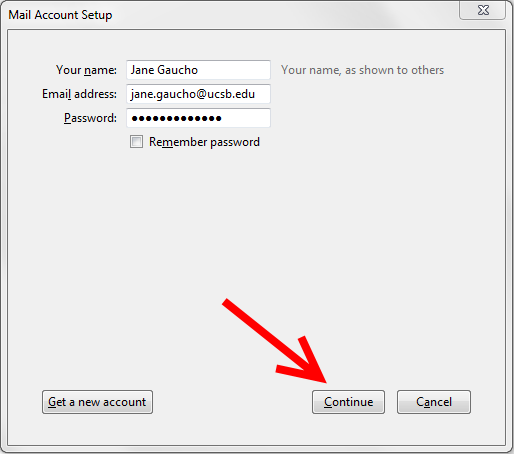 Select "Use a new account", type in your Connect address (UCSBnetID@ucsb.edu), then click Next. 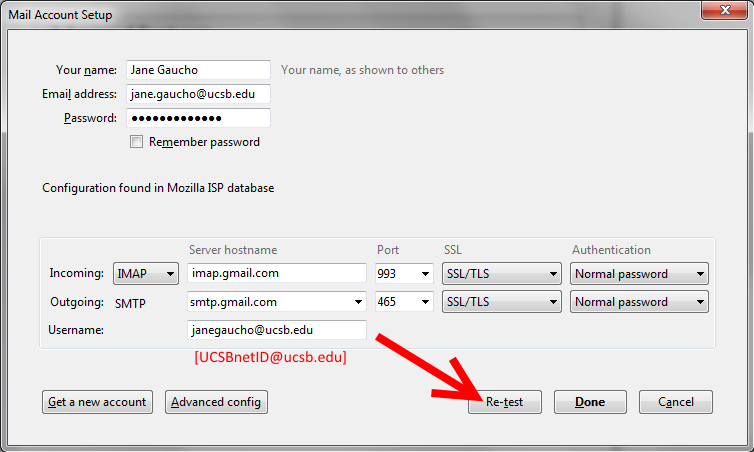 Type in your UCSBnetID password, click Sign in, then click Next. 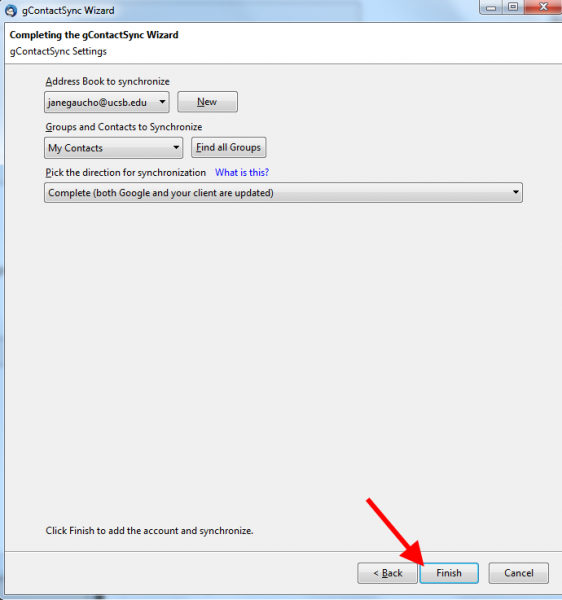 Confirm the contacts you wish to synchronize, then click Finish. Right-click on your addressbook and select Sync Now. Be patient while your Google Contacts sync to your address book. When you see the Synchronization Summary, click OK. Removing an account from Thunderbird will not delete any emails. Access 'Account Settings' by selecting the icon with 3 parallel bars on the far right of your Thunderbird window, select 'Options' and 'Account Settings'. 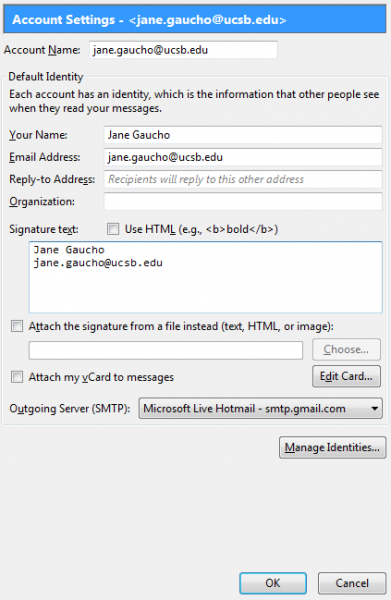 You should now be ready to use Thunderbird with your UCSB G Suite account.